When it’s time to buy your next vehicle, there is a lot of planning and preparation that goes into deciding which one is the best choice for you. Our team here at Certified Autoplex is working to make this process easier for drivers by providing detailed research pages to give them a better idea of what our vehicles have to off. Our dealership only carries used vehicles, which means we’re experts on all brands. This time we’re going to shine a light on Acura, which is the luxury division for Honda. Although we don’t have that large of a selection available on our lot now, it’s important to note that our inventory is constantly changing. The Acura lineup includes three sedans, two SUVs and one ‘supercar’, but all of them are guaranteed to impress. Let’s dig deeper into the lineup to get an idea of what each of these vehicles has to offer. One of the most popular models is the Acura MDX, which is classified as a full-size SUV with seating for up to seven passengers. 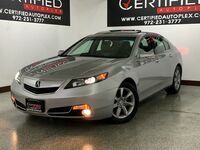 Right now this is the only model we have available here at Certified Autoplex from the Acura brand. The models we have in stock are either 2014 or 2015, so they’re definitely not outdated by any means. One thing that makes us unique is that the majority of our inventory is only a few years old. This allows for drivers to choose from newer models that are much more affordable than they would have been brand new. The Acura MDX SUV is full to the brim with safety and technology features, and the performance capabilities are sure to impress. All three of the models on our lot are equipped with a 3.5-liter V-6 engine and paired with an automatic transmission. Front-wheel drive is standard on two of the three, and the last one is set with all-wheel drive for even more traction and control. Some of the notable features are a navigation system, sunroof and leather heated seats. Other Acura models include the ILX, TLX and RLX sedans as well as the RDX crossover SUV and NSX Supercar. More information about this brand is available by contacting Certified Autoplex directly. Drivers are welcome to schedule a test drive online today! Interested in a Used Acura Models?